CHARLESTON — Leaders in the West Virginia Legislature say they’re confident there just might be money in the state budget to move West Virginia forward this year. A discussion about the state’s budget, and the “West Virginia Forward”study commissioned by West Virginia University, took place Friday during the Legislative Lookahead annual gathering of state media in Charleston at the offices of the Charleston Gazette-Mail. 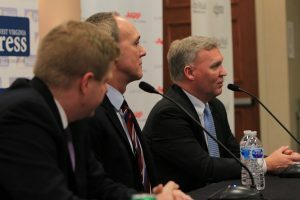 Senate President Mitch Carmichael, R-Jackson, and House Speaker Tim Armstead, R-Kanawha, took part in the panel discussion, as did Rob Alsop, vice president for strategic initiatives at WVU. Alsop attended in place of WVU President E. Gordon Gee, who is recovering from a fall while leaving Pittsburgh International Airport this week. Alsop said the optimism being expressed by state lawmakers this year will create an atmosphere in which the Legislature may be open to discussing the tenants of the West Virginia Forward report. The report calls for more money for rebranding West Virginia, site preparation for more businesses to locate in the state and tackling West Virginia’s opioid crisis. West Virginia Forward is the result of a cooperation between WVU, Marshall and the West Virginia Department of Commerce.